Here’s another marriage in trouble, this time from the wife’s point of view. And again, a child is at risk. Trish is a novelist whose husband has left her. 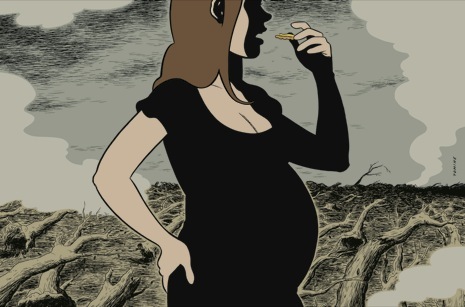 She’s pregnant, beginning to worry about money—the novel’s success is nice, but probably not enough. Her brother tells her that her husband has been writing a blog called “I Can’t Stand My Wife.” It turns out that her friend David knows about it, too. She has a meeting with some “movie people” and they’re interested in completely changing her novel. Her mind is somewhere else, like on a letter she received from a fan who has an idea for a movie based on the Tunguska incident. After she looks that up to find out what it is, it stays in her mind. I’m not sure the pieces of this puzzle fit together. >I don't know about you but I'm a little dismayed by the lack of actual "real" short stories in this New Yorker fiction issue. This story is just a tiny piece of memoir. Although, there are some really nice passages, it is not a short story, to me. >All in all, a disappointing effort. I'm with you. The whole point of the story is to show how people react to tragic events. Her husband just left her, and her unborn baby. She is freaking out over the littlest things that do not matter, because she is upset, that is what people do when bad things happen.